For the Kissinger Sommer the members of the sponsorship association are more than just founders. They are reliable friends in which you can place your trust. They in turn are treated as premium customers of the festival. They have numerous advantages such as receiving the festival program earlier than other customers and having the right to pre-order four weeks in advance. The incredible demand and sold-out events in the past years have shown that this is a great perk – members can also choose their seat before anyone else. Since the Kissinger Sommer 2017 all members of the sponsorship association receive a personal VIP card, distinguishing them as premium customers. The code on the back of the card makes buying tickets easier. Another advantage: When presenting the card, the owner gets the program brochure for free. The Kissinger Sommer sponsorship association supported four concerts in 2017. The piano concert with Arcadi Volodos on 06/18/2017, the Ensemble 1700 with Andreas Scholl and Dorothee Oberlinger on 06/29/2017, the Münchner Rundfunkorchester on 07/02/2017 and the Bamberger Symphoniker on 07/15/2017. After the concert the members were invited to a traditional greeting in the Rossini-Saal. There the heads of the association presented the mayor of Bad Kissingen with a check of € 75,000. Furthermore, the association funds the Kissingen Piano Olympics since 2003. Since 1999 the association also awards new artists with the Luitpoldpreis, worth € 5,000. So far the award winners are Nikolai Znaider, Alisa Weilerstein, Jochen Kupfer, Isa Gericke, Baiba Skride, JanKobow, Mojca Erdmann, Peter Ovtcharov, Tine Thine Helseth, David Lomeli, Igor Levit, Kejia Xiong, Anna Lucia Richter, Julia Novikova, Konstantin Shamray, Kian Soltani, Sung Min Song, Andrei Ioniţă and in this year Julian Trevelyan. This young elite already presents itself as stars. 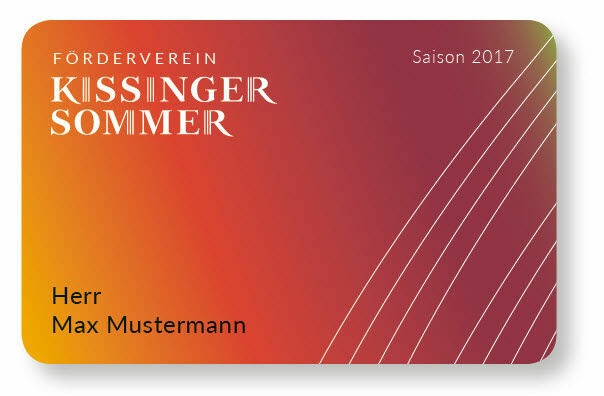 The joining form for the Kissinger Sommer sponsorship association is printed onto the back of the ordering papers and is available as a downloadable pdf on the homepage of the association. Become a member of the Förderverein Kissinger Sommer e. V.